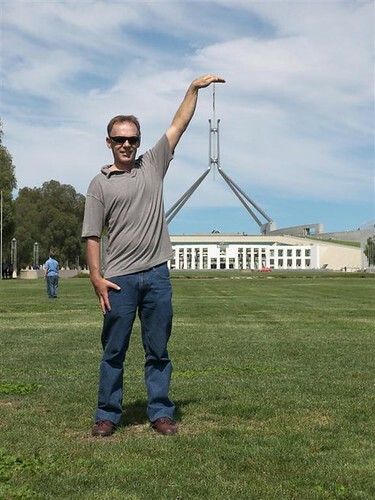 Here is Wayne Burke in Canberra earlier this year. For the National Day of Prayer and Thanksgiving, Wayne, his wife Chris and I attended this moving time of reflection, repentance and redemption. It was a time to uphold our Government, prayer for repentance on behalf of the nation and ask for God’s provision of water to this dry land. Here is the good news of the Vision Radio Network’s 300th station. This was such an amazing time to see the ministry come to a new level as the community of Yarrawonga in Victoria came on-air. This was especially significant as the people of Yarrawonga had earlier blessed another community by donating the funds for our 200th station to begin broadcasting in Yulara in the heart of the outback of Australia. Celebrate with us as UCB’s CEO, Ian Worby (the Steve Irwin of Christian Radio) introduces you to our latest member of the family. Recently I have spent some time with young man from New Zealand. Over the last few days I’ve got to know this young man who is passionate, focused and looking to live his life for God. He certainly has been an inspiration in a short space of time. I know that he would be the first to admin that he doesn’t have it all together but what he has recognised in his own life is valuable. He has prepared his heart for growth and change. Try as you may you can’t find a country as fresh, vibrant and enticing as New Zealand. I know its hard to put it into words. How do you explain "God’s Own"? to the ski fields of a volcano. peer into the depths of the trout-lands. while hunters crouch far from the trail. the fern and web of forest homes. wanderer is at peace with the settler. in the mist of a Genesis creation. Just watching the ‘latest’ Peter Pan with my daughter. Wendy’s daughter ‘Jane’ has traveled to Neverland and fallen for the grown up lies of Captain Hook. Of course the difficult question to be asked is; ‘Does Hook represent Jane’s Dad or Granddad? The one thing I love about the old Walt Disney movies is they would follow on from the old story format of parables. Jesus did it best with his ability to weave spiritual truth into the lives of everyday people. Often we can be in the same country and not speak the ‘same language’. Its not about French, Cantonese or dialects gone by. More to the point we have often found that we have complicated our basic language by either adding new words or the changes of structure through colloquialisms and slang. However when language fails and our communication doesn’t deliver the intended message we can come back to a ‘story’ where we simplify the elements to make sure the actual message remains strong. Aesop’s fables tried and so did Mother Goose, but pick up a Bible and see what Jesus did in the Gospel books of Matthew, Mark, Luke and John. The master storyteller had a message that has spanned ages. Incredibly people have looked at the Bible in many ways for many needs and constantly found answers for their situation. It has proven in the life of its readers, the ability to adapt and yet be consistent. I remember one person saying in reference to the Bible and going to Heaven that ‘Bible’ stood for ‘Basic Instructions Before Leaving Earth. More important, when you read the whole Bible you see its a Love Story to you.